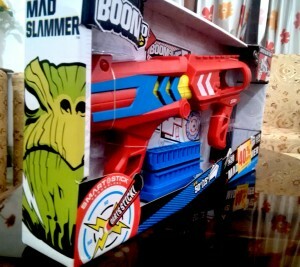 To be honest, the BOOMco Mad Slammer isn’t something you’ll like on first glance. Its a simple, non-intimidating red colored toy blaster. That’s what it is. No shields, no hidden shotguns, not even a trigger. People usually go either for a blaster’s aesthetics or its practicality, so its no big surprise that it hasn’t endeared itself to either of the demographics. 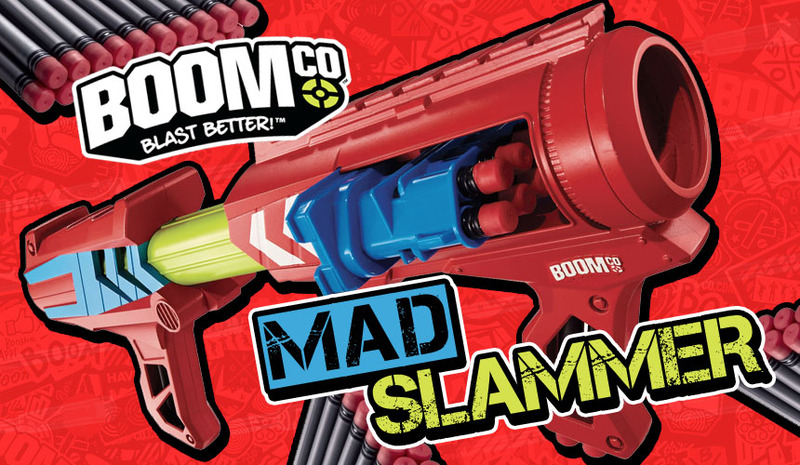 And that’s really unfortunate, because underneath all that gaudy red mediocrity, the BOOMco Mad Slammer is versatile, fun and justifies its name and position in the BOOMco lineup. Let’s check it out! 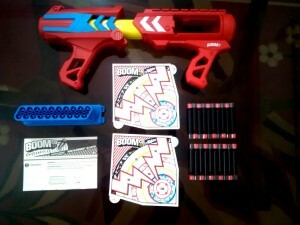 Inside the box, there is the Mad Slammer blaster, a 20-dart clip, 20 Smart Stick darts and 2 identical Smart Stick targets. Once taken out of the box, the Mad Slammer seems adequately sized, albeit a bit on the smaller side, though that can be attributed to the small handles and simple design. In its un-primed form, its about 15 inches long. Once primed, its over 17.5 inches long, with the yellow plunger housing sticking out from the middle. The first thing I, or in that case, anybody will notice is that it looks remarkably like a toy. 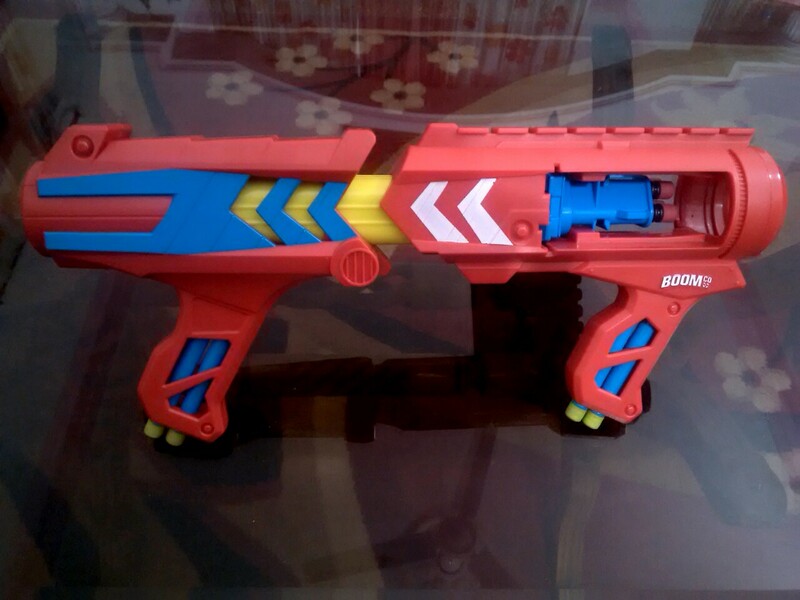 The round, red body with light blue accents and the lime yellow plunger housing make it look very different from both Nerf and other BOOMco blasters, and not in a good way. I’m a big fan of blaster aesthetics, and when kept next to a Nerf Cycloneshock or even a Rapid Madness, the Mad Slammer seems out of place. There are elements that portray good designing, but its more of a hit and miss in the aesthetics section. 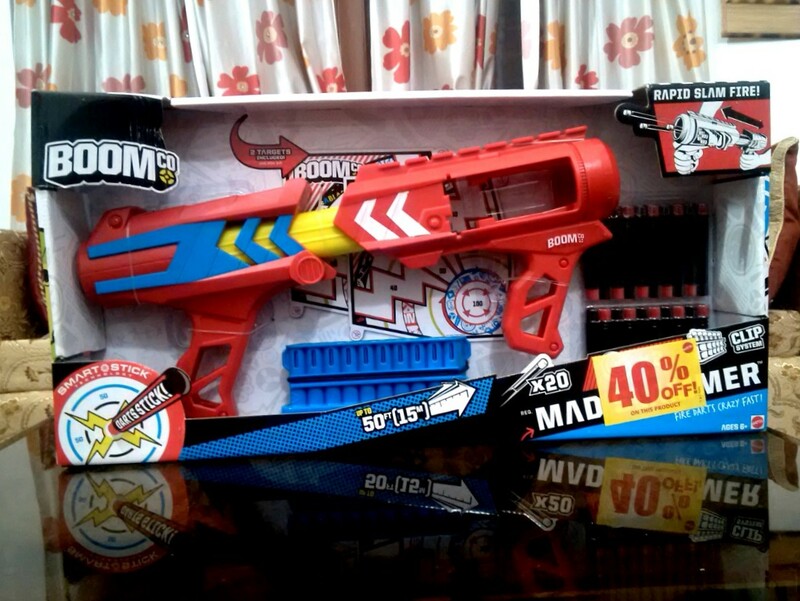 The round, red body with light blue accents and the lime yellow plunger housing make it look very different from both Nerf and other BOOMco blasters, and not in a good way. When viewed from an ergonomic standpoint, the Mad Slammer is, in a word, unrefined. I really wished I could move over some of the not-so-good aspects of this blaster, but they’re too blatant to be ignored. The handles are just not designed to accommodate adult hands, and that’s not only because they’re small, its also because they’re not properly designed. I did a quick comparison between the Cycloneshock’s handle and the rear handle of the Mad Slammer, and they’re about the same length, the only difference being the angular, sharp edges around the Mad Slammer’s handle, compared to much smoother and sleek lines of the Cycloneshock’s. Otherwise, the thumb rest is comfortable enough, although its a bit sharp on the front handle. Sure, the dart storage in the handles is a nice touch, but a handle is a lot more than just that. The good news is, the ragging is over. Everything that was wrong with this blaster has been covered. The bad news is, everything good about this blaster is all internal, so someone who doesn’t own this blaster will never know that this little red ‘toy’ might just be the most versatile weapon in the blaster scene as of now. This little red ‘toy’ might just be the most versatile weapon in the blaster scene as of now. 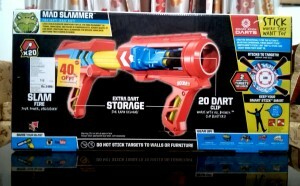 To fire the blaster, load the clip until it clicks, pull back the rear handle, and push forward to fire, the usual drill with slam fire blaster. One thing that you’ll immediately notice is that there’s no force when pushing the handle forward, and just before the blaster is fully compressed, off goes the shot. 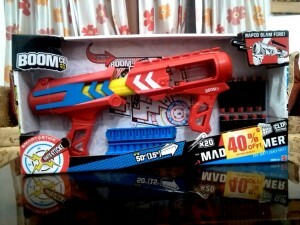 That’s because the Mad Slammer isn’t just a slam fire only blaster, its a controlled slam-fire only blaster. Behold, the Mad Slammer’s ace in the hole, the secret that makes it a formidable force in the battlefield. Still not impressed? Check out the stats below, and you will be. Following my usual drill, I fired the blaster 3 times from shoulder height, parallel to ground and 3 times angled to ground, at about 30 degrees. Given below are 2 tables, which are the average of 3 parallel firing tests and 3 angled firing tests respectively. I used the 3:4:3 ratio to split the high shots, the medium shots and the low shots. All readings have been rounded off to the nearest integer. Again, the blaster was fired three times, the average of the three recorded times given below. For the sake of accurate readings, I did not round off the time, thus it goes into centiseconds. The time was calculated from trigger pull to last dart fired. Rate of fire= 3.4 darts/second. From 25 feet in a closed environment, dart spread was around 12 inches, and there was a tight grouping of 5 darts within 4 inches. 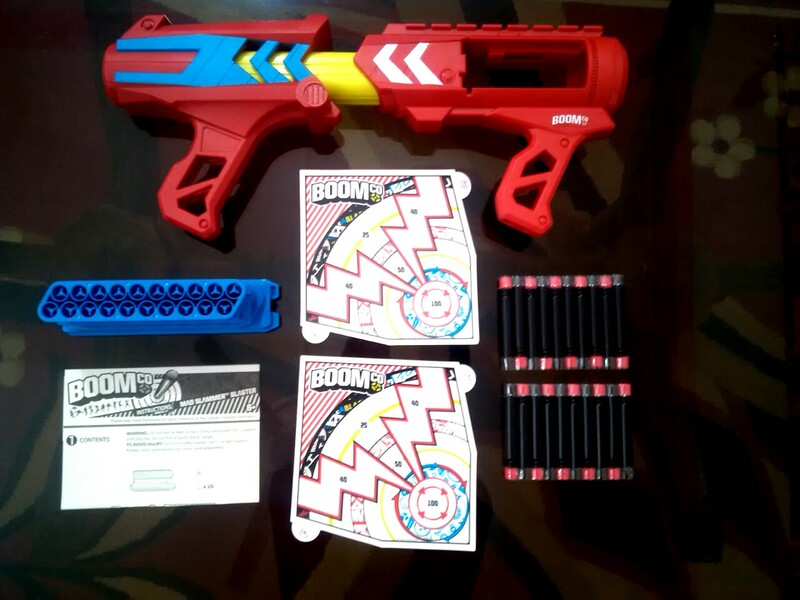 BOOMco darts have yet again proven that they have a better dart design than elite darts, and that one can coax out decent accuracy from them even when paired with a slam fire blaster. The Mad Slammer owes it to its well designed internals for its good performance, and it doesn’t disappoint in being a reliable blaster too. 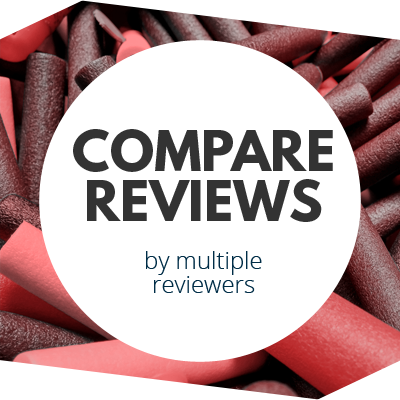 Fast slam fire seems a bit hollow, but the performance remains the same at the the compromise of accuracy. Getting the hang of single shot firing might be a little tough, but once mastered, the Mad Slammer can easily dominate the battlefield. In a word, I was prepared not to be impressed with this blaster, but the Mad Slammer was quick to unveil its true form and prove that its a force to be reckoned with. 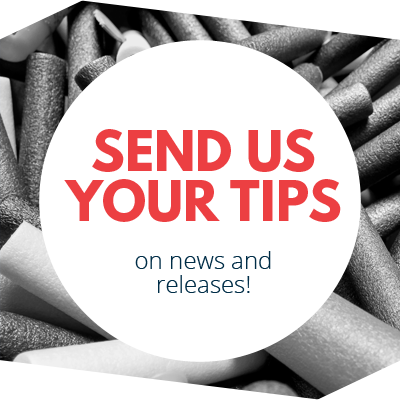 Good ranges, high rate of fire, accurate and fairly small, this is, in other words, the Alpha Trooper of the BOOMco world, only more accurate. Take it to your next battle as a secondary, and watch as it slams through the opposition! 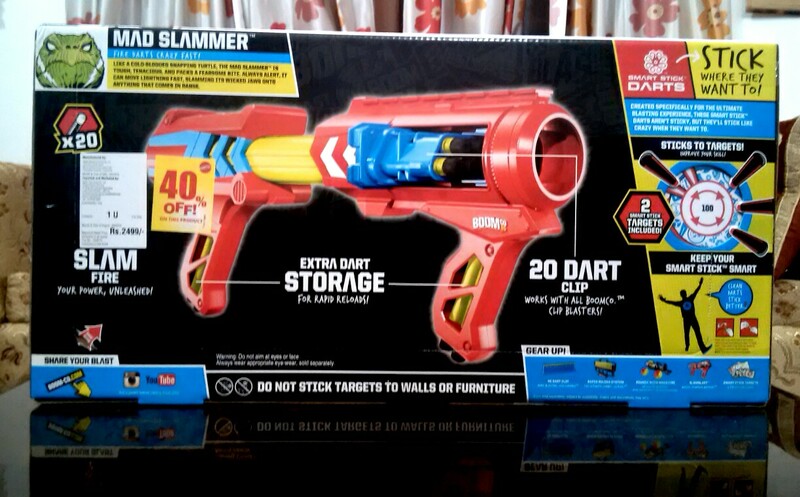 This entry was posted in Dart Blasters, Reviews and tagged 2015, boomco, mad slammer, mattel on January 18, 2016 by Stryker450. Ooh, I simply love it when authors put themselves in their reviews.